That Bush and Rice are wholly incompetent to hold their jobs has been patently obvious from the beginning, when Rice started off by making insulting and derogatory remarks whenever she mentioned Russia, yet while as National Security Advisor prior to 9/11 failed to provide any national security whatsoever. Talk about being downright abrasive and rude, hardly the behaviour required for a lady diplomat, but then again, nobody ever expected any better because she is not a diplomat, never was, never will be. She is a cheap, dimwitted guttersnipe, an apology for a lady and a human being and wholly unfit to hold the office and serve her country, both of which her very presence insults. As regards Bush, well, one has only to go to the Bushisms website and the man comes across as a vapid and abject joke. True, he looks pretty good holding a plastic turkey and does appear to have the ability to improvise with kids on the White House lawn when left alone with them, appearing to be on the same intellectual level. Kind of like a retarded uncle who hangs around the ranch saying inanities but who nobody ever takes seriously. As for Cheney, this eminence grise learned a long time ago to shut the f. up and do his evil deeds behind closed doors. Nice man. After all, here is the man with all the contacts among his neocon friends, the corporate elitists whose policies dictate what Washington does and how many people its foreign policies kill. Nice man. Rumour has it that not even his own family speak to him. And how clever he was when all those contracts were allocated without tender after the US military forces targeted civilian structures in Iraq. Nice man. If this pig-headed trio of crypto-fascists was to focus on its own country’s deeds, then nobody would have anything to say. It is, after all, up to the people of the USA to vote for whoever they wish to lead them, deceive them, act against their interests, get the country hated in the international community, screw up its economy…whatever turns you on. However, the constant intrusion into Russia’s sphere of interests, the barrage of lies they sell to the corporate media parading them as the truth, and the stream of insults and provocations that come from these legions of Baal cannot and will not go unanswered. Just who do Bush and Rice think they are, considering they can tell Russia when to take its troops out of Georgia? Has the USA taken its troops from Iraq? Has Russia got concentration camps like Abu Ghraib or Guantanamo Bay? Did Russia go after Saakashvili and hang him? Have Georgian soldiers been forced into human pyramids, had dogs set upon them, been raped, water-boarded, their food peed into or forced to eat disgusting things which go against their culture? Did Saakashvili not declare a ceasefire and while he was doing so mass his troops, savagely attack Tskhinvali, destroy 85% of the city’s structures with military hardware and slaughter 2.000 civilians on 7/8 August? 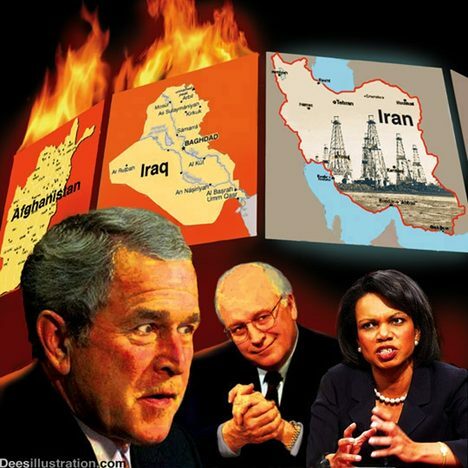 In their failure to mention the cause of the current conflict once, Bush, Rice and the entire odious regime give their tacit approval to Georgia’s war crimes, just as they gave their tacit approval to the war crimes perpetrated in Iraq and elsewhere (CIA torture flights and ships, and Guantanamo Bay concentration camp). Just how involved were the US military adviors that night when Georgian peacekeeping troops fired on their Russian colleagues and when the barrage of bombs and missiles killed 2.000 civilians, when Georgian tanks ran down old ladies, when Georgian US-trained troops threw grenades into basements full of huddled and terrified women and children? Was this what the US forces trained them for? And if yes, would anyone be surprised? So, here it is, loud and clear, for Bush, Cheney and Rice to understand. If they think that like Goebbels, they can repeat the same lie time and time again until it becomes the truth, they are wholly wrong, as wrong as the miscalculated act of aggression against Russia, which led to the military forces they support being thrashed. Russia made a limited response to an act of provocation, its right under international law, in which 2.000 of its citizens were killed by US-trained Georgian troops in one night. Quite what this trio were thinking they would achieve that night, only they know. What they lost must have been big, given the soreness and arrogance in their voices today, and the attempts at self-justification. And once again, Russia rules the roost, Russia calls the shots these days, Russia stands for respect for the law whereas Washington flouts it, Russia stands for peace whereas Washington stands for war, Russia defends debate, dialogue and disscussion while Washington favours antagonism, arrogance, bullying, belligerence, back-stabbing, chauvinism and skulduggery as its diplomatic tools, and Condoleeza Rice as its mouthpiece. What a sorry-looking business card. For two weeks now, they have been telling Russia what to do. Two weeks on, Russia is doing what it understands it must do and will leave Georgia as and when it sees fit. If Bush and Rice want to continue making fools of themselves by repeating the same thing over and over, it just proves their utter impotence to gain anything from yet another failed Washington policy. Has there ever been a successful one?